Earlier this week we reported that Google was gearing up to launch its Google Play gift cards in the UK, and we’ve now learned they’ll be on sale in the country from today – Wednesday. The cards, available in denominations of £10, £25 and £50, can be bought at branches of supermarket giants Tesco and Morrisons, though it’s likely that more stores will start selling them before too long. Check out the image (right) from a Eurodroid reader showing the shiny new cards looking rather comfortable alongside similar offerings from Apple and Facebook. Curiously, the £50 card is absent from the display, though presumably it’ll be up there soon. 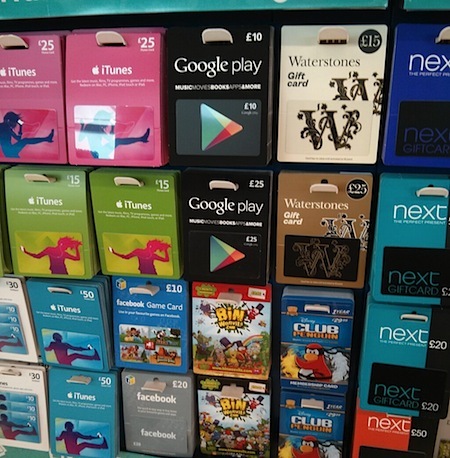 The gift cards can be used to make digital content purchases from the web giant’s well-stocked Google Play store, which includes Android apps, music, movies, TV shows and digital magazines. The vouchers can not, however, be used to buy digital subscriptions, hardware or accessories. – At play.google.com/redeem by entering the redemption code on the back of the card. – During the purchase flow when you come to choose a payment method. – By using the Redeem option on the Google Play Store app on your device. Thinking about it, you wonder why Google didn’t have the means to roll these out before Christmas. With so many Nexus tablets flying off the shelves over the holiday season, these cards could’ve proved popular as an accompanying gift. The Mountain View company launched its Google Play gift cards in the US last summer – partnering with Target, GameStop and RadioShack – where they’re available in denominations of $10, $15, $25, and $50. At the current time, the cards are only available for purchase in the US and UK. We’re pleased to announce that Google Play gift cards will be available in the UK from today [Wednesday, March 6 2013]. Gift cards make it even easier to buy apps, games, books, movies, music and magazines from Google Play, Google’s one-stop-shop for all your digital entertainment needs. Over the coming weeks, gift cards will go on sale in all UK branches of Tesco and Morrisons. 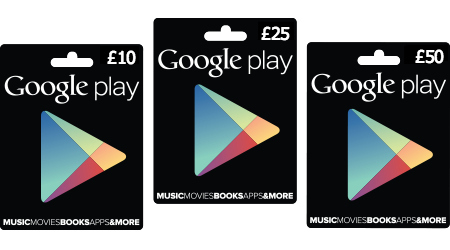 The gift cards will be available in denominations of £10, £25 and £50, and can be redeemed against digital contntent purchases on Google Play, including music, magazines, books, movies and apps. On the web: Users of Chromebooks, PCs, Macs and all other computers can access their digital content online through the web version of Google Play (play.google.com). And now users can pay via Google Wallet or by redeeming a Google Play gift card.